Namibia is a treasure house of folklore traditions. Until recently Nama and Damara grandmothers told a great variety of folktales. Most people will be surprised to learn that besides ancient African trickster tales, tales of magic and animal tales, the Namibian grandmothers tell many tales like Cinderella and Snow White. What is most exciting: the grandmothers did not read them in books but learned them from their grandmothers, who, in turn, had learned them from their grandmothers. The author, who has published nine volumes of various Namibian traditions in this series, devotes this volume to the amazingly great group of tales which came orally from Europe or Asia. In part I she offers 62 stories, mainly collected by herself between 1960 and 1999, which have not been published before. Part II gives the background information on the narrators, part III a study of the history and character of 48 individual tale types and a general discussion of the fate of the originally European and Asian tales in Southern Africa. Most of these tales were brought to South Africa in the 17th and 18th centuries, were adopted and adapted by the Khoekhoe already at that early time and, mainly in the 19th century, wandered with them to Namibia. During this long period the originally European and Asian tales turned into Nama and Damara tales. Part IV adds the tools for a closer study: analysis of all existing variants of this group of tales (ATU 300-999), motif index according to Stith Thompson, subject index and a survey of the Afrikaans tales of magic. Following the link at the bottom, you will find the full review text by Christine Goldberg (pdf file). Von großem Gewinn für die internationale Typen-, Stoff- und Motivforschung und eine gelungene Ergänzung des ATU ist der im vierten Teil vorgestellte Anhang [...] mit einem für Gesamtafrika detailliert strukturierten Typenkatalog, der Erzähltypen einschließt, die im vorliegenden Band nicht behandelt werden [...], sowie Ergänzungen und Korrekturen zu bereits bestehenden südafrikanischen Typenkatalogen [...], eine Typenkonkordanz und ein Motiv- und Sachverzeichnis enthält. 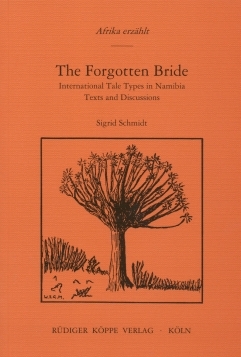 The Forgotten Bride would work as a self-guided introduction to comparative folktale scholarship. The texts in part 1 are engaging. Part 2 identifies each tale-type number, which the reader can use in part 4 to locate a summary and corroborative texts. Then, in many cases, part 3 explains the variation in that tale type and its distribution in Namibia, Africa, and elsewhere. More experienced folktale scholars can use the book in the same way, but they will also value the glimpses it affords of folktales in the seventeenth and eighteenth centuries.